Support The Mount Group RDA - buy your Melton Lottery tickets here! We rely totally on donations by individuals, grants and support from charitable trusts and companies, and fundraising by volunteers. As any horsey person will tell you, keeping a horse is expensive. It costs about £20,000 a year to run Mount Group RDA. This mainly goes to pay for hiring the horses' and ponies needed for the riding sessions, specialist tack and equipment and support for our riders to compete. We ask riders for a donation towards the cost of the horses for their sessions but we never exclude a rider who cannot afford to pay. Everyone who helps at Mount Group - whether coach, helper, groom, driver or whatever - is a volunteer. Whether you are an individual or a company, your support for our work is much appreciated. Thank you! A huge thank you toYMD Boon and their 13 runners , for running the Derby 10k on Sunday 15.4.18 for The Mount YGroup. Well done from us all. You are all stars!! 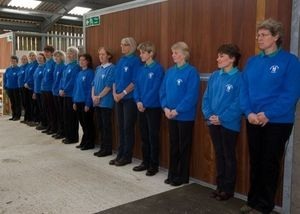 The Mount Group RDA are were included, as part of the Tesco Bags of Help, at the Tesco branch in Oakham. Shoppers used their tokens to vote for the Mount Group RDA. It's fantastic news, as we won and therefore won £4000. A huge thank you to all shoppers that voted for and supported us. Support us via Melton Community Lottery! Click here to register and purchase your tickets. Please ensure The Mount Group is the selected cause. Support us as you shop! If you shop online, you can donate to The Mount Group for nothing. www.givingabit.com will pay us a donation every time you make a purchase online from your favourite shops, including Amazon, Sainsbury's, John Lewis, Argos and many more. On average, 3% of whatever you spend is given to us as a donation - and at no extra cost to you. home and garden, there are lots of opportunities for you to donate to us for free. Just go to www.givingabit.com and sign up for free. Once you’ve entered your name, email, user name and password - click on ‘Support you favourite charity’ and in the search box type The Mount Group Riding for the Disabled Association. We have received some extremely generous donations and grants recently. Susanne Birley who completed 12 Half Marathons / long runs in 12 Months in 2014. All those who have taken part in our Loughborough Santa Fun Runs.